The POE-xxi is an advanced power supply / power inserter. The power supply is auto ranging on the input and has a regulated voltage output. 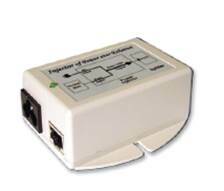 It has overload and short circuit protection in addition to Ethernet surge suppression built-in. The POE-xxi is not a proprietary unit. It will function with any equipment that is compliant with the IEEE 802.3af POE standards. For all “i” models, the power is supplied on Ethernet pins 4/5 (V+) and 7/8 (V-). For the “iR” models, the power is supplied on Ethernet pins 4/5 (V-) and 7/8 (V+). The POE-xxi comes complete with a standard North American 115 VAC power cord.